See more objects with the tag portrait, tool, accessories, handkerchiefs, multipurpose, caterpillars, satire, caricatures. See more objects with the color saddlebrown darkslategrey grey tan darkslategrey or see all the colors for this object. 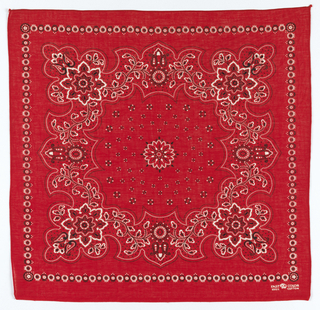 This is a Handkerchief. It is dated early 19th century and we acquired it in 1962. Its medium is silk and its technique is printed by engraved roller. It is a part of the Textiles department. 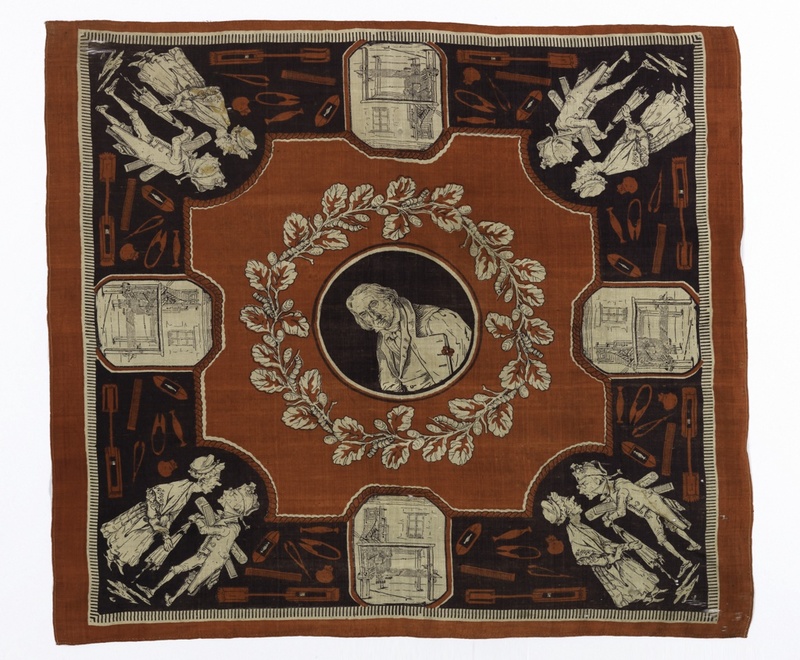 In the center of his handkerchief is a portrait of Joseph-Marie Jacquard (1752-1834), inventor of the jacquard loom. Patented in 1804, the loom included a punch-card mechanism for controlling the action of the warp, greatly simplifying the production of complex fabrics and revolutionizing the French silk industry, symbolized by the caterpillars and cocoons nestled in the oak wreath framing the inventor’s portrait. This object was purchased from F and G. Staack. It is credited Museum purchase through gift of Alice Lusk Webster.